Do you struggle with constant thoughts about food and your body? Are you anxious around certain foods? Is your "need" to exercise causing you to feel trapped? ​Do you look in the mirror and hate what you see? Struggling with anorexia is exhausting. "I can’t recommend this training from my colleague Jennifer Rollin, highly enough! It is full of good information, tangible exercises, and comes with a super helpful workbook. If you’re struggling with anorexia or if you’re a clinician helping people heal from AN, I highly recommend this training. I can’t wait to use some of the activities with my own clients to help them heal from their eating disorders." 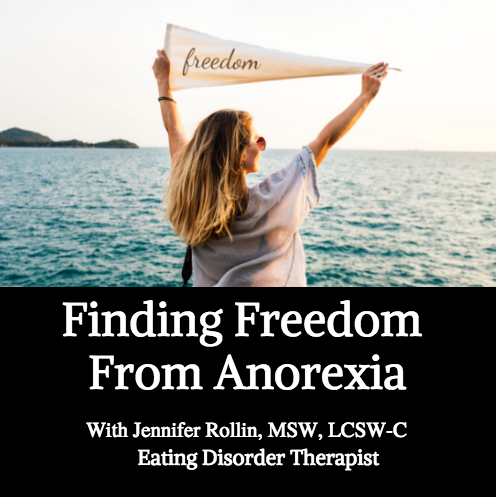 Jennifer Rollin's training on finding freedom from anorexia is awesome! She provides concrete exercises, insightful metaphors, and generally sound wisdom on healing from restrictive EDs. I would recommend this training to both clinicians specializing in ED treatment, and people who are trying to recover. Worth every penny!" -Danielle Swimm, Eating Disorder Therapist. ​"Thank you SO much for creating this training!! It has been incredibly helpful for me in my recovery and i'm planning to share the workbook with my therapist so that we can talk about it in session." I have helped many people to recover from anorexia. This on-demand training shares with you the strategies, concepts, and assignments, that I use with clients.